I preach the importance of record keeping all the time to tax clients, writers, and business owners! No one likes organizing records. If you just finished your tax return filings the last thing you want to do is look at them again. But now is the perfect time and it pays dividends. Here’s why. If you’ve ever tried to tell the IRS “I lost my receipt” you don’t want to do it a second time. The IRS has heard every excuse in the book. See IRS Publication 552. You’ll find it far easier if you don’t have to go to the additional effort of proving something by another means. 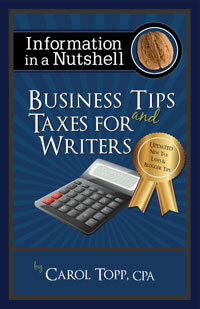 If you’d rather not read an IRS publication on record keeping, try my easier-to-understand chapter on simple record keeping in Business Tips and Taxes for Writers.